In 1997 we packed up our Atlas Pasta Machine. It was a sad day indeed, we knew we would not need it since our son was diagnosed with Celiac Disease and a few years later so was our daughter. We had attempted GF pasta with the recipes of the day and it was a gummy mess. Today we have discovered healthy gluten free flours such as millet, teff, pure buckwheat, quinoa, amaranth, and sorghum that allow for a higher quality pasta. And we also now know that a recipe should have no more than 30% of a starchy flour (such as cornstarch, tapioca starch, potato starch) for best results. About a year ago my daughter and I spent the day with Shauna, The Gluten Free Girl. Imagine my surprise seeing the same Atlas machine attached to her kitchen counter looking as though it was achieving daily use! It gave me immense happiness, a feeling of reestablishing the same atlas machine which had lost source in my kitchen. The first thing that flashed in my mind was that now I too can bake some healthy recipes for my children. Baking gets accustomed to some healthy options that can be included in our day to day life easier. The Gluten Free Ratio Rally always inspires me to dig a little deeper and put forth some energy. The rally is a group of GF bloggers who have joined together to test recipes based on a sample ratio and then share our trials and success. 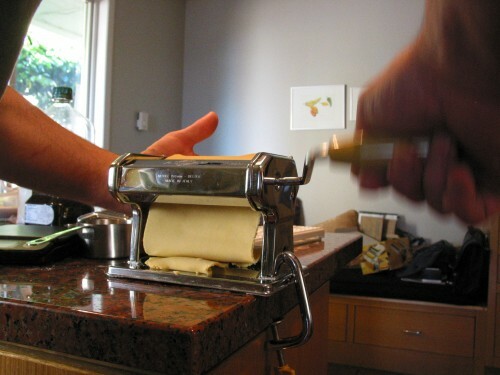 Hand roll the dough first to use in pasta machine. I am happy to report that I have finally had success with homemade gluten free pasta. And the amazing thing is I had success on the first go round! However, one of the wonderful things about fresh semolina pasta is its’ lightness and delicate nature. I am not fully there yet but I will be soon with this recipe as I take it through a few more spins. When I reach nirvana….. 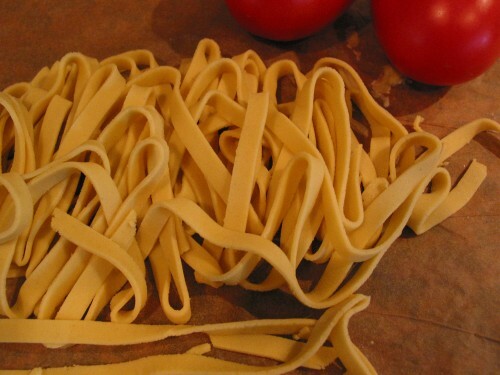 I will add updates to this post but go for this recipe now and enjoy fresh pasta goodness. I will make this for lunch and serve it with a little butter and a sprinkle of truffle salt for pure satisfaction. Pasta machine will stay on the counter now for easy access and USE. My goal was to use a true Italian recipe for the pasta. My husband played Husky football years ago with Dan Eernissee and his wonderful wife Amy is the real deal. An excellent cook from a long line of wonderful Italian cooks. Her family recipe for pasta is one kilo of flour for every dozen eggs. I bet you have a kilo of flour at your house! So I had to do a little adjusting and I had to take into account the unique elements of our flours. Basically Amy’s recipe is a 1:1 ratio of flour to egg (1 cup flour to one egg) but that doesn’t really work with our flours. Everyone else in the rally started from a 3:2 ratio so the comparison will be interesting. In the bowl of a stand mixer sift flours together with gums. Make a well in the flour and add eggs and oil. Using the paddle attachment run mixer on medium speed for about 3 minutes until a soft dough forms. (you can also mix dough by hand but the stand mixer is quite fast). 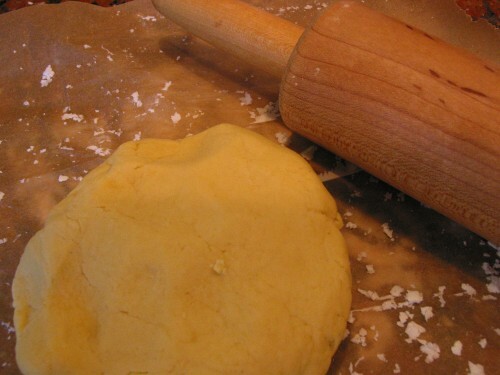 Roll out dough between two sheets of parchment paper. 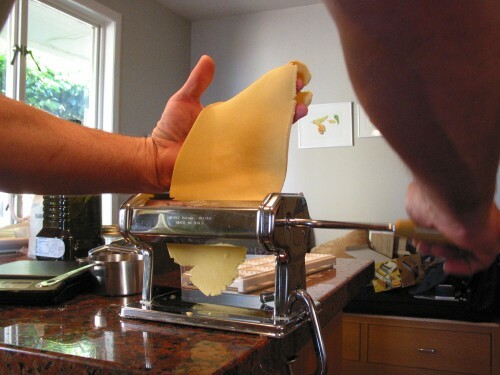 With the pasta machine dial set at one pass the dough through the sheet pasta side. Pass it through again at the number two setting. And then pass it through the machine to cut into fettucine. 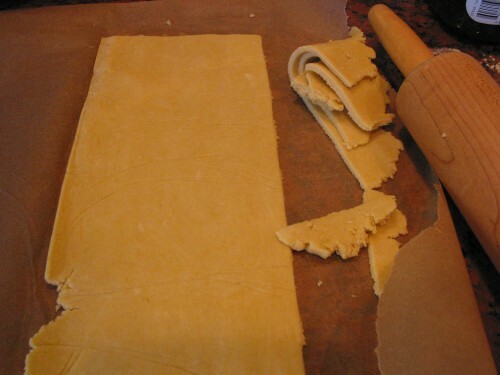 (if you are rolling the dough by hand do so between two sheets of parchment and roll as thin as you possibly can prior to cutting into noodles). Put two heaping teaspoons of kosher salt into boiling water. Cook pasta in boiling water for 5 minutes until slightly al dente. Drain and serve with some butter and a little truffle oil or truffle salt. 1. After reading other ratio rally ideas I am going to swap out the egg white for an egg yolk. 2. To achieve a lighter pasta (though this is quite good now) I am going to weigh a little bit of each whole grain flour that I have to see which one is lightest and I will use that instead of the millet. I chose millet first because it is a favorite of mine and it is the least expensive of the healthier flours. I also chose to use just two flours to keep ingredients to a minimum. 3. Once I find the lighter flour I will be making ravioli and celebrating. I haven’t had good ravioli since Adriattica closed way back when. 4. I may also try a 20 minute dough rest covered with a damp kitchen towel. Next PostNext Cooking Gluten-Free For The Holidays!